R.D. Olson Development is going upscale—and tall—with its latest hotel project in the Irvine Spectrum. 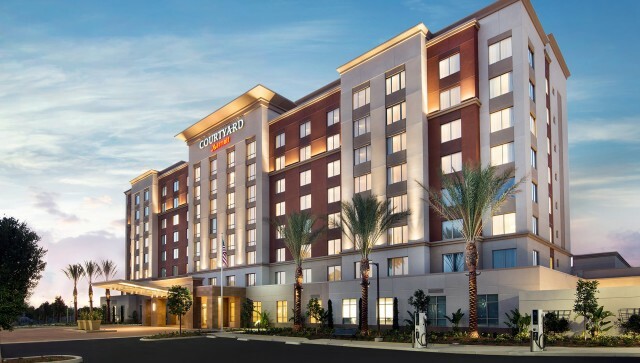 The Irvine-based company plans to build a 14-story, 250-room flagship Marriott hotel on land it owns near the Spectrum shopping center. The project is near the intersection of Alton Parkway and Irvine Center Drive next to a 210-room Courtyard by Marriott that R.D. Olson opened last year. West Coast rendering: only other Marriott in works with new look, amenities in Charlotte, N.C. The tower will break ground by year-end, according to Jonathon Vopinek, vice president of asset management for the company, which has been California’s most active hotel developer for several years. R.D. Olson said it plans to spend more than $100 million on the project, or $400,000 per room. The Marriott promises to be the first full-service hotel built in South Orange County in nearly 20 years and will add to a busy slate of construction—including offices, retail and apartments—under way in the Spectrum area. The Marriott would also take a spot at the high end of R.D. Olson’s roster of projects. The developer has built more than 1,000 hotel rooms in California and Hawaii in the past few years and has nearly another 1,600 rooms in the construction phase or under development, including notable projects in Huntington Beach and Newport Beach. Plans in the Spectrum include significant changes to the signature brand of Bethesda, Md.-based hotel chain operator Marriott International Inc., which has a lineup that ranges from Ritz-Carlton to Residence Inn. The Irvine hotel will feature a rooftop bar, a Starbucks, 5,000 square feet of ballroom space, and a pair of smaller meeting rooms, among other amenities. “This is an exciting hotel, as it will be the West Coast reinvention of the full-service Marriott hotel,” said Bob Olson, founder and chief executive of the company. Only one other project of its type is under development in the U.S., in Charlotte, N.C., Olson said. The hotel’s sleek design is aimed in large part at a younger generation of travelers and is being overseen by Irvine-based architecture firm WATG, which also designed the adjacent Courtyard by Marriott. Rooms at the new Marriott are expected to cost more than $300 a night. Nightly rates for the eight-story Courtyard by Marriott next door are in the $200 to $250 range, according to that hotel’s website. That eight-story hotel, which cost about $50 million to build, is one of the country’s best-performing Courtyard by Marriott hotels in terms of guest satisfaction ratings, according to the developer. The pricier new hotel is expected to draw customers from businesses such as Taco Bell Corp., whose headquarters sits across the street from the development site, as well as visitors to a pair of nearby office towers planned by Newport Beach-based Irvine Co., according to Vopinek. The first of the office towers, the 21-story 200 Spectrum Center, is scheduled to open next year. “Executives want a full-service hotel (in the area),” Vopinek said. The Spectrum’s host of businesses of various sizes generate a steady stream of visitors based on ties to parent companies overseas or across the U.S., plus customers spread over similarly expansive territories. 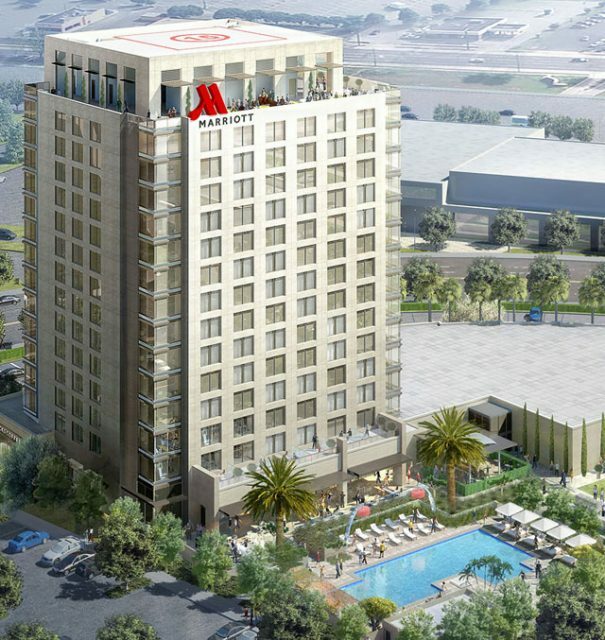 The new Marriott will provide another option for visitors who have been served largely by business hotels near John Wayne Airport or high-end resorts along the coast. R.D. Olson will retain ownership of the hotel upon its completion, and Marriott International will provide management services. The two companies have had an active partnership the past few years, with R.D. Olson building several Courtyard by Marriott and Fairfield Inn & Suites hotels in the region. R.D. 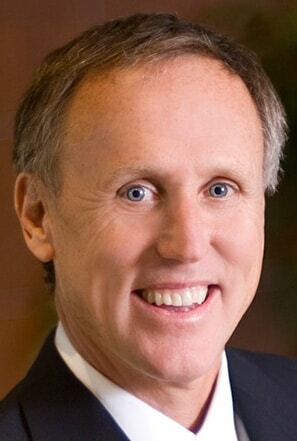 Olson was awarded Marriott International’s developer of the year award last year, reflecting the company’s work in “high-barrier markets” and its steady work during the recession.